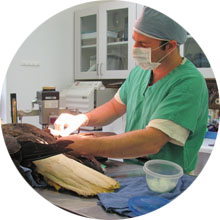 A Day in the Life of a Raptor Hospital features case studies and time stamps from the activity in CRC's Jim Arthur Raptor Medical Center. Photo by Michele Miller Houck. What will you find on your walk around the 3/4 mile Raptor Trail? 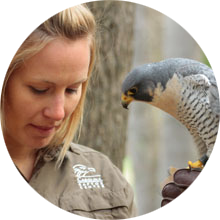 Over 30 species of raptors and other birds of prey are featured on this walk on the wild side. Owls, vultures, hawks, eagles, falcons, corvids, and other species that just don’t fall into any of these categories. Have you seen a Bald Eagle up close? 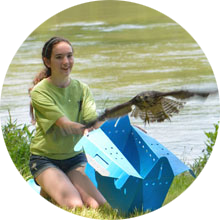 The Raptor Trail features a nesting pair of Bald Eagles who live out back in the Eagle Aviary. Our Spectacled Owl just can’t wait to tell you what she thinks about living here at CRC, but you might have to listen carefully to what she has to say – she’s a shy one. Did you know that vultures and corvids are some of the smartest birds around. No bird brains here! 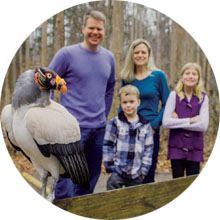 Lots of human mythology surrounds both of these families of avian brainiacs. Crows have been known to drop nuts into crosswalks so that cars can crack them and then wait for the light to change and retrieve the goodies! Behind the scenes at CRC is our Raptor Hospital, where we see approximately 900 raptor patients a year (please no songbirds or possums!). If you can’t make our behind the scenes tour, don’t worry, the exhibit “A Day in the Life of a Raptor Hospital” will show you what goes on there – day and night.